Bow, London 22 May 2017: Bywaters, the company operating London’s largest under cover materials recycling facility will be exhibiting at the 2017 Facilities show at Excel in London on 20-22 June. Members of the Bywaters team will demonstrate their ‘Green Guru’ educational service to promote recycling and reuse and demonstrating an innovative new waste audit app that delivers same-day reports. Other cutting-edge recycling and waste management solutions and expert knowledge of the waste and recycling industry will be shared with visitors to Bywaters’ stand at Q1160. Responsibility for recycling and waste in multi-tenanted buildings can mean FM’s managing multiple suppliers, each with different measurement standards, which makes performance benchmarking almost impossible. Bywaters helps its clients, particularly in multi-tenanted buildings, by placing its “Green Gurus” (environmental experts) on client sites to educate, inspire, monitor and implement waste reduction programmes for banking, hotel, hospital, government and corporate clients, embedding best practice behaviour amongst staff. Using just one waste management company to handle waste for a multi-tenanted building means one point of contact, one central report and one supplier to manage. Environmental performance can be tracked and evaluated in a more standardized, quicker and easier way. Promoting best practice in sustainability, persuading staff to think and behave in a more environmentally-friendly way can be supported by Bywaters’ Green Gurus ongoing education and communication programmes to reinforce key messages. 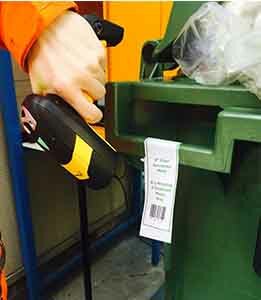 Waste tracking and weighing systems can monitor and measure waste production and contamination with pin point accuracy using a combination of managed services with integrated Green Gurus, ‘bag and tag’ systems, branding and signage, bar coding, compactors and containers as well as legislative guidance and consultation. Bywaters’ Green Gurus can intervene where necessary and improve recycling rates if they fall below target in any particular department or area of a building. An advanced weigh-bridge system is also being developed which will act as a complete auditing tool, giving precise real-time data on waste activity so FM’s can measure their impact, cost and compliance. Facilities Managers can see for themselves how waste audits can be carried out accurately in the morning and final recommendations delivered later that same day using Bywaters new and innovative mobile app. Bywaters is an award-winning waste management company delivering bespoke recycling services for a range of public and private sector organisations in and around London and further afield. The company has won the Champion of Champions at the Green Apple Environmental best practice awards as well as three Green Champion awards, two gold and two silver prestigious Green Apple awards for their pioneering approach to the environment and their role in helping to improve London’s air quality. The company brings a partnership working approach to every contract providing technical, legislative and value added support with a focus on continuous improvement. For example, at Guys and St Thomas NHS Trust, overall recycling rates were increased by 20% in just one year. Other customers include Land Securities, Houses of Parliament, BNP Paribas, Transport for London and University College London. Facilities Show stand at Q1160.